artist, to receive serious critical appraisal from the world of letters. Others, such as Crockett Johnson's Barnaby, Walt Kelly's Pogo and Jack Kent's King Aroo, would follow, but Krazy Kat was the first. Herriman got in the habit of running an extra gag across the bottom of the Dingbat strip, about their cat and a resident mouse. In his words, it was done "to fill up the waste space" — but the gags grew more complex, and the cat and mouse characters richer and more fully rounded. On July 26, 1910, the mouse hurled a brick at the cat, thus inaugurating a major element of a relationship that would last over a third of a century. — and be remembered so long that as recently as 1995, a very similar scene, taken from a Herriman drawing, appeared on a U.S. postage stamp. In 1913, Krazy Kat moved out into a daily strip of his (her?) own. While its "Kokonino Kounty" landscape sported dozens of unique characters, including Mrs. Kwak Wakk, "Bum Bill" Bee, Don Kiyote and Kolin Kelly the brickmaker, at its heart stood a triangle — Ignatz Mouse, obsessed with beaning Krazy with a brick; Krazy Kat, who mistook the repeated assaults for affection; and Offissa Pupp, who expressed his unrequited love for Krazy by repeatedly jailing the miscreant mouse. A weekly page began on April 23, 1916 — but instead of appearing in color, with the Sunday comics, it was printed in black and white in the Hearst papers' art and drama sections. Thus, Krazy was introduced to a new audience, one that looked down its nose at ordinary comic strips. It was among such people that the strip found its most vocally appreciative readers. With the general public, however, Krazy Kat was never very popular. Those who liked it loved it, and would carry on enthusiastically about its subtleties and finely tuned character relations; but the majority, less sensitive to those subtleties, were unable to see its appeal. Among its admirers was William Randolph Hearst, who owned King Features Syndicate. That's why King Features wouldn't drop the strip, despite the fact that it was carried by fewer than 50 papers. But only Herriman was ever able to convey those subtleties and accurately render those characters. In the late 19-teens, Hearst produced animated versions of many King Features comics, such as Jerry on the Job and Maud the Mule. Krazy was included; but while a respectable effort was made to duplicate the characters and relationships, it didn't capture the subtleties. From 1925-40 Charles Mintz (fresh from having taken Oswald the Lucky Rabbit away from Disney and almost immediately losing it to Walter Lantz) produced dozens of cartoons with Krazy's name but little of the style — they imitated Felix too closely for that. (This set had several distributors, but settled on Columbia in 1929, which is also when they switched from silent to sound.) In a final animated series that came and went in the early 1960s, Paramount's Famous Studios licensed several King Features characters, including Beetle Bailey and Snuffy Smith, for TV production (leavened with a few theatrical released). These made a reasonable attempt to capture Herriman's style, but didn't quite make it. Dell Comics published ten Krazy Kat comic books between 1950 and '56, and Gold Key reprinted one of them in 1964. But these scarcely bear mentioning. 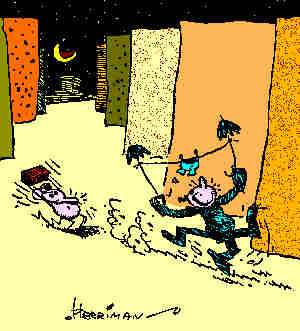 In 1944, King Features, following its standard practice upon the departure of a strip's creator, gave Krazy Kat to a new artist. When Hearst saw the result, he asked why his syndicate would distribute such sub-standard material. He was told that Herriman had died on April 25 of that year. Hearst immediately ordered the strip's cancellation, making it the very first syndicate-owned comic to end as a result of its creator's death. Today, Krazy is popular enough to sell copies whenever the strips are reprinted in book form. But his (her?) popularity generally holds to a similar pattern. Comics Revue, America's premier comic strip reprint publication, runs a half-dozen Krazy Kat daily strips in each monthly issue. As numbers go, it's the magazine's least popular feature — but the readers who do like it usually list it as their favorite. Text ©2000-09 Donald D. Markstein. Art © King Features Syndicate.